In the middle of June TD Canada Trust released a new set of cash back credit cards to our market. The high end version, TD Cash Back Visa Infinite Card is what we look at in this post. TD came out strong with their new high end offering for the Cash Back market with a never seen before return of 6%, albeit it is a time limited sign up bonus. Once you eat up the 6% the card isn't even a contender. Right now when you apply for and receive the card you'll earn 6% cash back in the first free months on gas, grocery and recurring bill payments. The 6% maxes out after $3,500 in spending in those categories for a maximum return of $210. Also as part of the introductory sign up offer the card is being offered with an annual fee waiver for the first year so the card does not cost you anything for the first 12 months. Once the first three months are complete the earn rate on gas, grocery and recurring bill payments drops to 3% up to annual caps of $15,000 on gas and grocery and another $15,000 on bill payments. Any other purchases on the card sees only a 1% cash back rate. The category bonus earn rate of 3% is decent however 1% back on the rest is pretty weak compared to its competitors like the SimplyCash Preferred Card from American Express or the mbna Rewards World Elite Mastercard which both offer a straight 2% on all purchases. 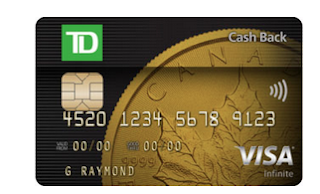 TD is also following the trend of the mbna card and several other cash back cards in allowing cardholders to redeem their cash back at anytime rather than once a year like the majority of cards in the cash back category so this is a bonus. On the benefits side, the card has one of the weaker packages out there for an Infinite Card with only Travel Medical Insurance (up to 10 days up to 64 years old, 4 days if older) and Delayed/Lost Baggage. No flight delay, no common carrier insurance, no trip interruption. My final thoughts on this card is that it was developed to target the Scotia Momentum Visa Infinite Card yet the latter card ends up being stronger, at least on the first $25,000 of spending and it also has a better insurance package attached to it and lower annual fees on primary and secondary cards. I really don't think TD did their homework on this one. Outside of the 6% initial bonus for the first three months there is nothing that stands out about this card. The 2% on all purchases from other cards, the higher returns from the Scotia Momentum and so forth in the cash back category are all better than this new offering. We would recommend checking out our Top Cashback Credit Card rankings and would pick any of those cards over and above this new TD card.